What is a Winnebago FUSE? Fuse, Winnebago RV: The Winnebago® Fuse™ proudly introduces the Ford® Power Stroke® diesel to America. This third generation high-performance engine has proven its worth overseas and is ready to put its 185-horsepower and 15-17 miles per gallon to work for you. It's a fitting chassis for a fun, contemporary Class C coach designed for active owners. 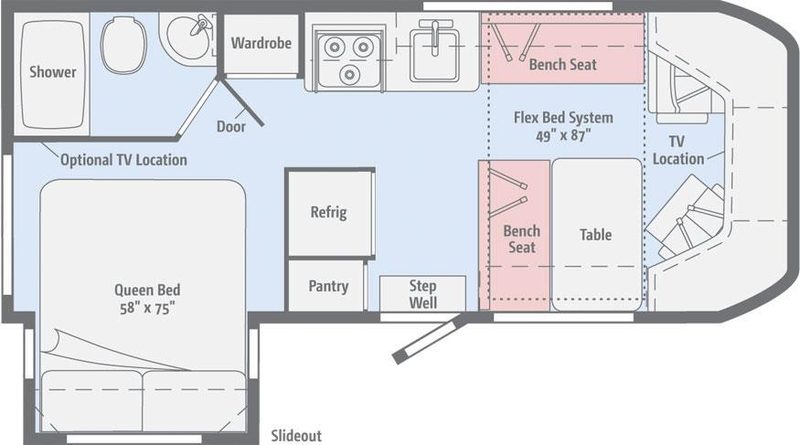 Two floorplans each provide multiple, flexible sleeping spaces, wardrobe cabinets and a full galley. And, while the Fuse is a budget-friendly coach, several premium features such as the FROLI® Deluxe Sleep System (23A), 6" multifunctional cab stereo/display, and a Carefree® Latitude patio awning come standard.